Chuba Akpom's second-half opener was not enough as England Under-21s are denied three big points by Switzerland in a Euro 2017 qualifier in Thun. Sunderland's young goalkeeper Jordan Pickford extends his contract at the Stadium of Light until 2020. Former Newcastle United goalkeeper Steve Harper deletes his Twitter account after being abused for joining Sunderland. Sunderland sign former Newcastle United goalkeeper Steve Harper on a short-term deal until the end of the season. Sunderland manager Sam Allardyce insists that Vito Mannone remains his first-choice keeper despite Jordan Pickford starting two of the last three games. Watford sign goalkeeper Costel Pantilimon from Sunderland on a three-and-a-half-year deal for an undisclosed fee. Christian Eriksen scores a brace as Tottenham Hotspur battle back from a first-half deficit to beat Sunderland 4-1 in the Premier League. Mousa Dembele makes his first start for Tottenham Hotspur since December, while Danny Graham joins Jermain Defoe in attack for Sunderland at White Hart Lane. Arsenal get their FA Cup defence off to a winning start with a 3-1 victory over Sunderland to book their place in the fourth round of the competition. Mesut Ozil is absent from the Arsenal squad to face Sunderland, who make seven changes. Goalkeepers Costel Pantilimon and Vito Mannone may leave Sunderland this month, admits manager Sam Allardyce. Preston North End secure the loan signing of Manchester United's 22-year-old goalkeeper Sam Johnstone. Alan Browne's own goal just after half time condemns 10-man Preston North End to defeat at Leeds United in the Championship. Birmingham City move to eighth in the Championship following a 1-1 draw against Preston North End. Joe Garner's goal gives Preston North End a 1-0 win over Reading at Deepdale in the Championship. Sports Mole previews the Premier League match between Sunderland and Watford at the Stadium of Light. Sunderland to recall Jordan Pickford from Preston North End loan? Preston North End face losing goalkeeper Jordan Pickford to Sunderland in January, as the Black Cats reportedly intend to recall him from his loan spell. Preston North End get the better of their local rivals Burnley as they triumph 2-0 in the Lancashire derby at Turf Moor this. Neither Burnley nor Preston North End are able to make the breakthrough in a goalless first half at Turf Moor. Blackburn Rovers boss Paul Lambert admits that he was elated to pick up a victory in his first game in charge as his side defeated Preston North End at Deepdale. Blackburn Rovers beat Preston North End 2-1 in a feisty Lancashire derby as the hosts end the game with 10 men. A Jordan Pickford own goal gives Blackburn Rovers a 1-0 half-time lead over Preston North End in Paul Lambert's first game in charge of the visitors. Duncan Watmore comes off the bench to inspire England Under-21s to a 3-1 victory over their Swiss counterparts in Brighton. England Under-21s struggle to find the breakthrough as Gareth Southgate's team head into the break against Switzerland U21s goalless in Brighton. Relive Sports Mole's live coverage of England Under-21s' come-from-behind 3-1 win over Switzerland Under-21s at the Amex Stadium. England Under-21s are stifled by Bosnia-Herzegovina Under-21s in a goalless draw as Gareth Southgate's side finish the game with 10 men. Tottenham Hotspur targeting Sunderland's Jordan Pickford? Tottenham Hotspur are pondering a move for Sunderland goalkeeper Jordan Pickford following his impressive performances on loan at Preston North End, according to a report. Queens Park Rangers and Preston North End head into the break at 0-0. Sports Mole looks ahead to the Championship meeting between Queens Park Rangers and Preston North End at Loftus Road. 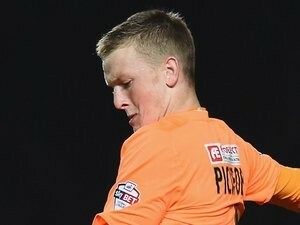 Sunderland to cut short Jordan Pickford loan spell? A report claims that Sam Allardyce is tempted to cut short Jordan Pickford's loan spell at Preston North End in January and bring the youngster back to Sunderland. Eoin Doyle scores the only goal of the first period as Preston North End lead Nottingham Forest. Neither side can find a breakthrough in the 90 minutes in the Championship clash between Preston North End and Bolton Wanderers at Deepdale. Preston North End and Bolton are level at 0-0 at half time of the Lancashire derby at Deepdale. Brighton & Hove Albion fail to break down Preston North End, but retain their four-point lead at the top of the Championship. Brighton & Hove Albion fail to break down Preston North End before half time in their Championship clash at the Amex Stadium. Charlton Athletic drop into the Championship relegation zone after a 3-0 loss to Preston North End. Paul Gallagher scores twice to give Preston North End the lead against Charlton Athletic. Preston North End and Cardiff City fail to break the deadlock in a relatively dull affair at Deepdale. Goals from Ruben Loftus-Cheek and Nathan Redmond guide England Under-21s to a 3-0 victory over Kazakhstan in their European Championship qualifying clash. Relive Sports Mole's live coverage of the 2017 European Under-21 Championship qualifier between England Under-21s and Kazakhstan Under-21s.